TORONTO—A Shen Yun performance has so much to offer: dancing, singing, a live orchestra, vivid landscapes, and a rich introduction to traditional Chinese culture. For Paul Younger, the singing of tenor Tian Ge was particularly memorable. Mr. Younger, who runs his own paralegal business, Younger Paralegal Services, took his mother to see Shen Yun Performing Arts’ opening night performance at Sony Centre on Wednesday, Jan. 21. Mr. Younger operates a diverse practice specializing in small claims court cases, employment issues, and landlord and tenant disputes, to name just a few areas. His mother, Diane, works as a warranty administrator with Honda. “It was wonderful. I thought the costumes were brilliant, I thought the music was wonderful, and I loved the singing,” said Mr. Younger. “I loved it, it was wonderful,” echoed his mother. Mr. Younger’s birthday and Christmas present to his mother was to take her to see Shen Yun. “She mentioned that she wanted to see it. I knew she wanted to see it,” he explained. He bought the tickets after seeing one of the many posters for Shen Yun around the city of Toronto while on the subway. His mother said she had been wanting to see it for long while. “I’m very happy to have gone. I liked it,” she said. The majority of Shen Yun’s over 20 vignettes involve classical Chinese dance, but the performance also includes vocal solo performances accompanied by the piano. Shen Yun’s tenor and soprano vocalists sing using the bel canto operatic technique, which is very similar to the technique used by the “10 great tenors” of the past. While the soloists sing in mandarin Chinese, the lyrics in Chinese and English are projected on the background screen. “I loved the tenor. I thought he had a beautiful voice. It was powerful and I thought it carried well through the audience,” said Mr. Younger. Tian Ge sang a song called “Fulfilling My Dream,” which is about his dream to go back to Heaven. “The power of the voice was beautiful. It resonated through the entire crowd. You could feel it in your chest as he was singing. It was wonderful,” said Mr. Younger. 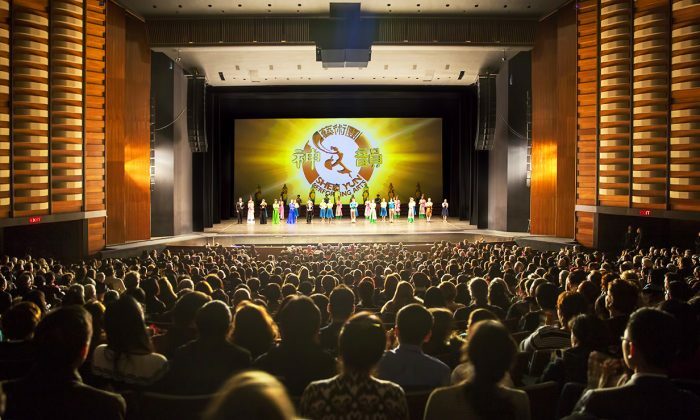 “Brimming with philosophical reflection about human life and containing deep layers of meaning, the texts go beyond the boundaries of nation, race, and culture,” states Shen Yun’s website about the song lyrics. Mr. Younger could not have given his mother a better present.